Getting the masses to move to a Linux distribution can be challenging, but the openSUSE Project is doing its part to get people started with open-source software. Members of the openSUSE community recently worked with Linux Magazine to publish a special edition of a Getting Started With Linux magazine with the purpose of increasing the openSUSE user base and teaching beginners how to make the switch to Linux. 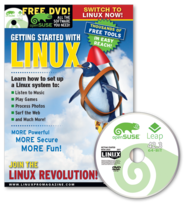 The 100-page special edition focuses on installing openSUSE Leap 42.3, using the installation and configuration tool YaST, understanding security and many other topics specific for Linux beginners. It also provides a crash course on Linux and goes in depth about the several applications available on Linux distributions and openSUSE’s default desktop selection, which currently is KDE’s Long Term Support version Plasma 5.8. Many of the articles written in the magazine are from community members of both openSUSE and KDE among others. From editing photos with digiKam to retro gaming, the magazine covers all sorts of topics, applications and commands using the Konsole Terminal. The special edition of the magazine will be available on newsstands throughout the globe over the coming months and openSUSE will have the special edition available for free at booths of upcoming open-source events. Pick one up at an openSUSE booth in the coming months and introduce a new user to the world of Linux through this comprehensible magazine. A special thank you goes out to the members of the community who helped develop the Getting Started With Linux magazine and to the community members who requested magazines to help teach new users about Linux and openSUSE. How refreshing to see Opensuse & KDE plasma – am quite fed up seeing ‘Linux introduction magazines’ with a ubuntu install dvd.